I was talking with a friend the other day about macaroni cheese (as you do). She told me she likes to use plain mature Cheddar in hers, for that sharp tang. We talked about using Brie, Stilton and other cheeses but I still stood with my preference for Emmental. It's nutty, slightly salty and although I have added a good handful of Cheddar for all-round cheesiness, it just doesn't leave you with a dish as rich and oily as the other cheeses seem to. You could also arrange some tomato slices on top or snip in some ham, chicken, chopped spinach or partially cooked broccoli if you wanted to. Cook the macaroni in plenty of salted boiling water, until just al dente - should take about 10 minutes. Drain and toss with a little of the pasta cooking water to help prevent it sticking together. While the pasta's cooking, you can get on with the sauce. Preheat the oven to 200ºC and butter a small roasting or lasagne dish. Melt the 25g butter in a saucepan and stir in the flour, to make a roux. Add the mustard and then small amounts of the milk, in stages, making sure to beat well between each slosh of the milk, to help stop any lumps forming. Once you've added all the milk, keep the pan on the heat and stir constantly, until thickened and smooth. Turn off the heat under the saucepan and stir in the cheese, reserving a handful for sprinkling on top later. Taste, and season with a little salt and pepper. Tip the cooked macaroni into the roasting dish and pour the sauce over the top, stirring to combine thoroughly. Sprinkle the reserved cheese over and then bake for 15-20 minutes, until bubbling hot and golden on top. Serve immediately, on its own in a bowl or alongside a sharply-dressed green salad. I never thought of using Emmental in mac and cheese. 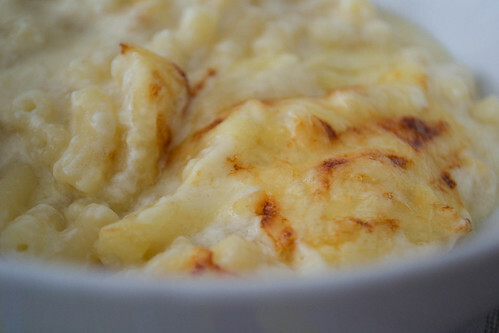 I have some left over homemade Emmental which I am planning to use in this recipe next week.